PARKTRONIC is only an aid. It is not a replacement for your attention to your immediate surroundings. You are always responsible for safe maneuvering, parking and exiting a parking space. 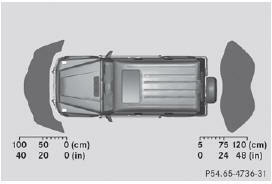 Check in front, behind and to the sides of the vehicle before maneuvering, parking or exiting a parking space. 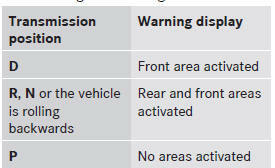 There must not be any persons, animals or objects in the area in which you are maneuvering. PARKTRONIC cannot identify any persons or objects outside of the detection range. As a result, PARKTRONIC cannot warn you about objects in this area. The sensors must be free from dirt, ice or slush. Otherwise, they may not function correctly. Clean the sensors regularly, taking care not to scratch or damage them . 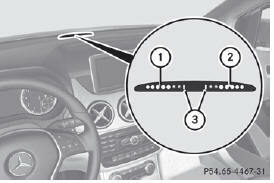 The warning display for the rear area is located on the headliner in the rear compartment. • sixth segment onwards, you will hear an intermittent warning tone for approximately two seconds. • seventh segment onwards, you will hear a warning tone for approximately two seconds. This indicates that you have now reached the minimum distance. 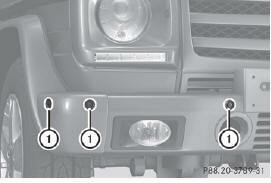 If indicator lamp 1 lights up, PARKTRONIC is deactivated.